When I was growing up tradition was everything, and we have tried to create some of our own traditions for our kids. On holidays we shine in this department. Every Fourth of July my brother Rich and I and our families meet at my parent’s house in Vermont. We don’t always arrive or leave on the same day, but we make an effort to be together for at least two days. 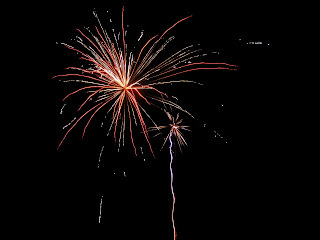 That meant that the kids and I had to travel on the Fourth, which would have been easier if I hadn’t discovered I need FOUR new tires on my way out of town (long story that involved a flat tire on the way home from the concert and a dream that prompted me to check my tires before leaving – good thing!). Luckily Benny’s was open - and funny – there wasn’t a big line of people waiting to get their tires changed on the Fourth of July. Still, traffic on Cape was bad and we didn’t get on the road until close to 2:00. We arrived at 5:56 (and it was 67 degrees, making Julie the winner this trip of BOTH the time and temp upon arrival contest). Rich, Barb, and their two boys, Adam and Colin had arrived the day before and had spent the day picking strawberries and making jam. Dinner was almost on the table when we arrived. Tom grilled some burgers and hot dogs and my Mom made two platters of a new potato and green bean salad from the Better Homes and Gardens Healthy Family Cookbook. 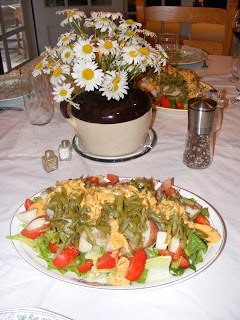 It was like three side dishes rolled into one – potatoes, veggie, and salad – and very yummy. 2 pounds whole, tiny new potatoes, halved or quartered. In a large saucepan cook potatoes, covered, in boiling water for 15 to 20 minutes or till just tender. Drain, cool for 20 minutes. Cover and chill potatoes and beans for 2 to 24 hours. To serve line platter with lettuce. Arrange potatoes, green beans and tomatoes on lettuce. Drizzle Yogurt-French Dressing over salad and serve immediately. Makes 6 side dish servings. Yogurt-French Dressing: Stir together 1/4 cup bottle French salad dressing; 3 tablespoons plain fat free yogurt; 1 tablespoon mayonnaise; and 1 green onion sliced.